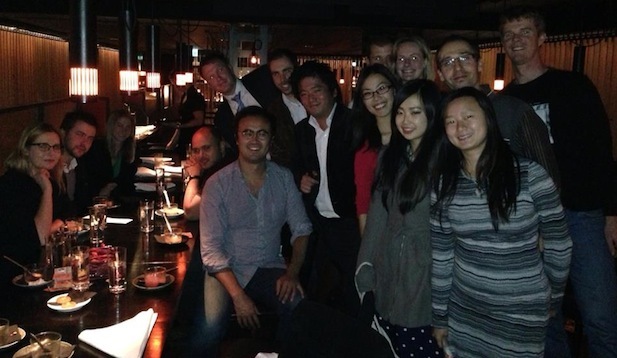 On Thursday the 6th of June ACYD Alumni based in Melbourne caught up at Spice Temple in Melbourne to meet delegates from other years and catch up. It's tremendous to see how everyone is going post ACYD! Huw Pohlner is heading to Oxford on a Sir John Monash Scholarship, Hayley Ward is heading to Beijing to begin work at the Australian Embassy, Phil Wen is heading to Beijing to become the next Age and Sydney Morning Herald correspondent, Fiona Lawrie is starting Thirst Australia's operations in Melbourne, Andrew Nicholls is heading to Hong Kong with DLA Piper, Wesa Chau is running in the Federal Election for the seat of Higgins, and Henry Makeham is off to Hong Kong to start as a lawyer with US law firm, Sidley Austin. Stay tuned for updates from Shanghai and Beijing in the coming months.